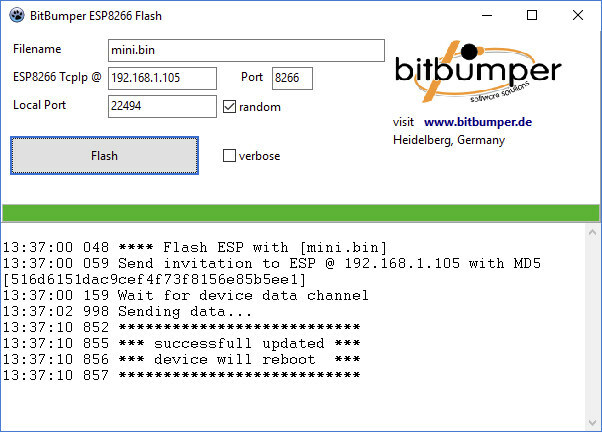 While it’s possible to perform OTA firmware update of ESP8266 with platformIO, Jochen wanted a standalone program to update the firmware of his ESP8266 based devices, and since he could not find any that satisfied his needs, he decided to write his own ESP8266 standalone OTA update tool: BitBumper ESP8266 Flash. So: I can now put TASMOTA on my Sonoff S20 without having to open them? Wow, the most short and useful description how to impement OTA in code. Thanks. I’ve read so many resources and there was no mention what basic step to enable OTA on ESP8266. So can this tool flash some compatible devices running original eWelink firmware to open-source firmware like ESPurna, Tasmota, like an alternative to SonOTA without soldering the serial header? Or to migrate from ESPurna to Tasmota without connecting to serial console? No it can’t. The only option I know of to upgrade Sonoff devices without opening them is the SonOTA method you mentioned. I’m using Mongoose-os for dev and OTA.